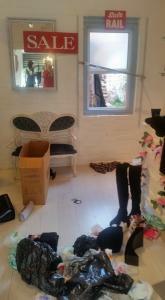 Thieves have stolen clothing and accessories worth more than £4,000 from a boutique in the Wirral area near Liverpool. According to the Liverpool Echo, thieves broke into KARAS Boutique in Pasture Road, Moreton in the early hours of last Friday morning (30 October). Police have since revealed that coats, boots, tights, leggings, handbags and necklaces were stolen, along with the boutique's distinctive hangers, which are worth £400. Overnight break-ins are a constant threat for retail outlets because the items inside represent a quick profit for thieves. Retail insurance and shop insurance policies are available for this exact reason - these will cover the items kept within a store as well as the building itself in case it is damaged by criminals. Owner Kara Sumbler says she opened the boutique in March last year, having previously run a business selling odds and ends from the same premises. She said that in her 13 years at the site it is the first time thieves have broken in the shop. She told the local paper: "They somehow managed to take the metal cage off the window at the back and came in through that. "I’ve bricked up the window and the back door and there are shutters on the front. Now there’s no way they can get in unless they’re going to smash a brick wall." Ms Sumbler added that they went through the racks and only chose the most expensive items to steal, which might suggest they were stealing to order. She has also posted a picture of the damage done (seen here) on Facebook, but said she is not holding out much hope that anyone will come forward with information on the identity of the thieves.